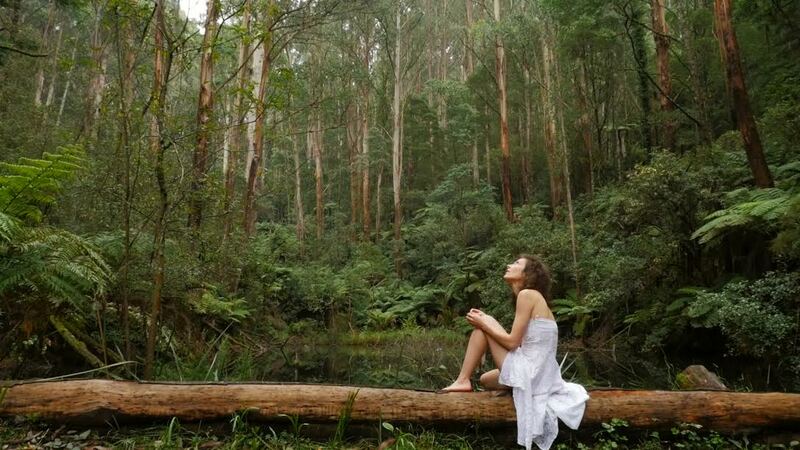 Grace Lowry in Agatha Yim’s film Undine: The Spirit of Water. Feminine water-spirits may be found in diverse mythologies, from Ancient Greek Sirens to the Slavic Rusalka and the Thai Phi Phraya. The “Undine” appears relatively recently, in the writings of the renaissance Swiss-German alchemist Paracelsus. Paracelsus classes the Undine as a water elemental alongside the airy “Sylph,” the earthy “Pygmy” and the fiery “Salamander.” The Undine is remarkable for being a much more benign creature than its predecessors, the unfortunately-stereotyped women seducing and drowning sailors. Paracelsus was, after all, a man of science. Syzygy Ensemble’s programme for the Metropolis New Music Festival asked the question “What is the spirit of water in music?” Four composers provided four different answers to this question, interspersed with beautiful and humorous videography by Agatha Yim. In Yim’s short film, a charming Undine (Grace Lowry) prances about a Victorian rainforest encountering members of the ensemble. Cellist Blair Harris ineffectually chops wood in his concert blacks, flautist Laila Engle wrestles the Undine for a light bulb, and was that a fleeting shot of pianist Leigh Harrold I saw floating in the water? A narrative emerges throughout the concert, with a young man falling in love with the Undine before becoming married to another woman, without ever forgetting the Spirit of Water. Helena Tulve’s Streams 2 is an experiment in musical current. A current has not only force, but depth. In Stream 2, a single instrument always holds the work together with a smooth, legato line. Tulve favoured the dark tone of the clarinet in evoking the viscous flow of water. The rest of the ensemble resembled flotsam or the play of light on the water’s surface with ricochet bowing, whispering flautando flurries and rubbed woodblocks. Tulve’s streams are not splashing torrents. Instead, we hear the steady stream from within, like the submerged Undine at the end of Yim’s first video. 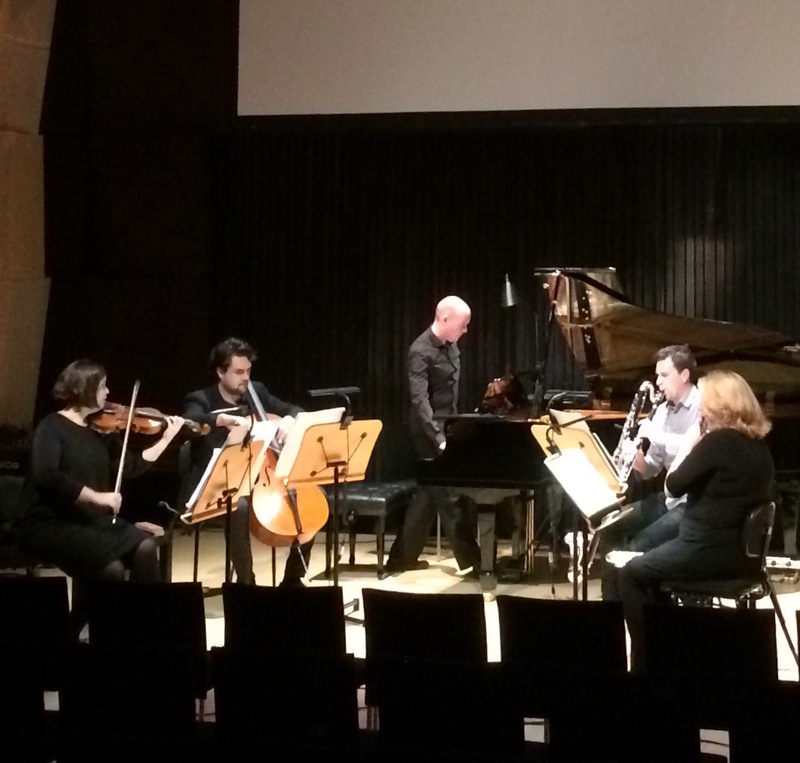 Syzygy Ensemble rehearse Undine: The Spirit of Water at the Melbourne Recital Centre. Photo courtesy of the artist. Tom Henry’s Time is Another River provides a much more thematic depiction of a watercourse. The work for violin, cello and piano features beautiful counterpoint with long melodic lines that rise, float and fall. Marc Yeats’ The Half-Life of Facts provides a jarring and welcome contrast to Henry’s mellifluous river. Yeats’ piece is an absolutely unrelenting ten minutes or so of fragmented extended techniques including Bartok pizzicati, string glissandi and bass clarinet grunts. The lights changed from red to yellow and back to red again half-way through the piece, as if to highlight the monotony of the barrage of sound. After Yeats’ complete fracturing of contour, the audience mustn’t have minded retreating into Niels Rønsholdt’s reassuring use of repetition and rhythmic motifs. Instead of water, Rønsholdt’s Burning is accompanied by a projection of a match catching alight in the dark, albeit reduced to a shadowy black and white image with the tones inverted. The piece features a rhythmic cross-rhythm that is tapped out quietly on the backs of instruments like a post-rock mantra before being howled out in desperate waves (along with some desperate teenage poetry) by the whole ensemble. During these climaxes, the piano part grows from glissandi across the keyboard to vigorous assaults with the palms. Undine: The Spirit of Water is a magnificent response to the festival’s theme: “Music inspired by the moving image.” As the composers featured in the programme have shown, water and movement go hand in hand. Helena Tulve, Streams 2; Tom Henry, Time is Another River; Marc Yeats, The half-life of facts; Niels Rønsholdt, Burning.